I want to start by confirming there are no exceptions that will completely exempt a commercial driver operating in the oil and gas field from all of the hours of service regulations. No driving after 8 hours since the driver’s last off duty break of 30 minutes or more, unless the driver qualifies as a short haul driver under Section 395.1(e). Note: Drivers transporting Division 1.1, 1.2 or 1.3 explosives must log the break as on duty if attending the vehicle. No driving after 11 hours of driving time within a 14 consecutive hour driving window. No driving after 60 hours on duty in seven consecutive days or 70 hours on duty in 8 consecutive days, depending on whether the company operates vehicles on the road every day of the week. Once a week (that is, once every 168 hours), a driver who gets 34 hours or more off, may restart his 60 or 70 hours. 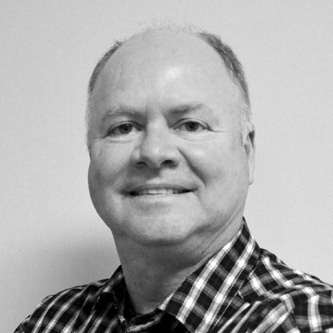 There are 3 exceptions in the hours of service regulations for oil and gas field drivers. Drivers that haul exclusively in support of oil and gas field operations can get a restart after only 24 hours off instead of the standard 34 hours. Not only that, it can be any 24 hours. Drivers operating specially constructed vehicles requiring specialized training can log waiting time, at well sites as off duty time. Drivers that qualify for this exception do not have to count the waiting time against their 14 consecutive hour limit. One key way to determine if a driver qualifies for the exception is, “Can the vehicle only be used in oil and gas field operations due to its construction?” If the answer is yes, then the driver can use this waiting time exception (found at Section 395.1(d) (2) in the regulations. Drivers using this exception cannot use the short haul exceptions. These are also referred to as the “100 air mile” and “non-CDL 150 air mile” exceptions. 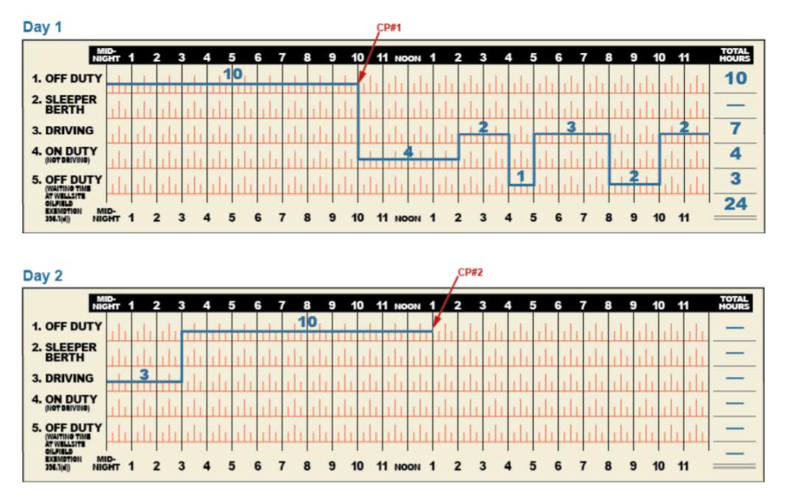 These 2 exceptions allow the driver to keep a time record in place of a regular grid graph log, provided certain conditions are met. 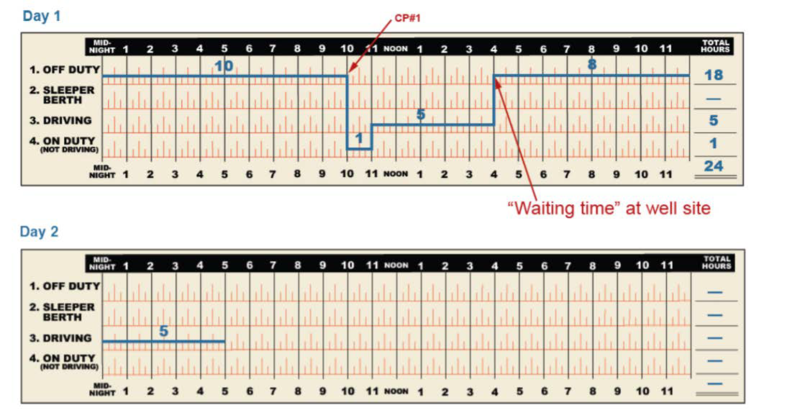 The reason a driver using the waiting time exception cannot use one of the short haul exceptions is the driver needs to be able to show specifically what time was spent waiting at a well site, using either the remarks area or an additional 5th line (“waiting at well site” line) on a standard grid graph log. Specially trained drivers operating specially constructed equipment can also only use this exception. 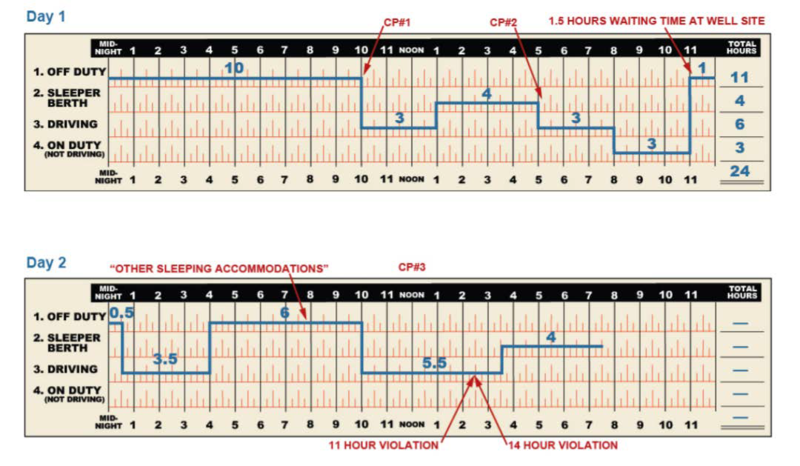 Drivers can use any break of 2 hours or more in a sleeper berth or sleeping facilities at a well site as a qualifying break, and any 2 qualifying breaks can be combined to make the 10-hour break (there is no eight-hour sleeper berth requirement). In addition, all qualifying breaks do not count toward the driver’s 14-hour calculation. The exceptions to the hours of service regulations are located in Section 390.3 and Section 395.1. If the driver is not involved in an activity discussed in one of these exceptions, the regulation applies as written in the regulations. Explanation: This is an example of “waiting time” for certain drivers at oil or gas well sites [See 395.1(d)(2)]. This time, which is off duty and does extend the 14-hour “driving window” period, is denoted from 4:00 p.m. to Midnight on Day 1. This “waiting time” must be shown on the paper log or electronic equivalent as off duty and identified by annotations in the remarks section of the log or a separate line added to the log grid. The “waiting time” is shown on a 5th line added to the log grid on Day 1. Violations: There is a violation of both the 11-hour driving and 14-hour “driving window” rules at 2:30 p.m. on Day 2. Explanation: This is an example of the use of the oilfield exemption for hours of service. It helps explain the point of whether or not a driver is permitted to use well waiting [time] and the split break together. After 10 consecutive hours off duty on Day 1, the driver had 14 hours available (and 11 hours driving) beginning at 10:00 a.m. (CP#1). The driver drove for 3 hours, and then spent 4 hours in the S/B. The driver then drove for 3 more hours, was on duty for 3 hours, spent 1.5 hours of waiting time at the well site, drove for 3.5 hours, spent 6 hours in “other sleeping accommodations” and then drove for 5.5 hours before ending in the S/B for 4 more hours on Day 2. This is an example of “waiting time” for certain drivers at oil or gas well sites (§395.1(d)(2)). The 4 hours in the S/B may be combined with the 6-hour break between 4:00 a.m. and 10:00 a.m. on Day 2 to constitute a legal break. Additionally, the 1.5 hours of “waiting time” at the oil well site is not counted towards the 14-hour “driving window” calculation. This time, which is off duty and does extend the 14-hour period, is denoted from 11:00 p.m. on Day 1 to 12:30 a.m. on Day 2. There is, however, a subsequent violation. Starting at CP#2 (5:00 p.m. Day 1) the driver drives for 3 hours, is on duty for 3 hours, drives for 3.5 hours more, and then drives for another 5.5 hours. The driver has gone over by 1 hour both the 11 and 14 hour limits at 2:30 p.m. on Day 2. Explanation: This example demonstrates the use of the oilfield exemption for hours of service, and use of the 5th line on the record of duty status (RODS) graph grid. It explains periods of off-duty time as oil well waiting accumulated, which is excluded from the calculation of the available 14-hour “driving window” time. After 10 consecutive hours off duty, the driver had 14 hours available (including 11 hours driving) starting at 10:00 a.m. on Day 1 (CP#1). The driver was on duty for 4 hours, then drove for 2 hours, was off duty for 1 hour, drove for 3 hours, was off duty for 2 hours, and then drove for 5 hours. This is an example of “waiting time” for certain drivers at oil or gas well sites. The 1-hour off duty between 4:00 p.m. and 5:00 p.m. on Day 1, and the 2-hours off duty between 8:00 p.m. and 10:00 p.m. on Day 1 are excluded from the 14-hour calculation, and are denoted on the 5th line of the RODS graph grid. This time (3 hours in total) is off duty and does extend the 14-hour period. 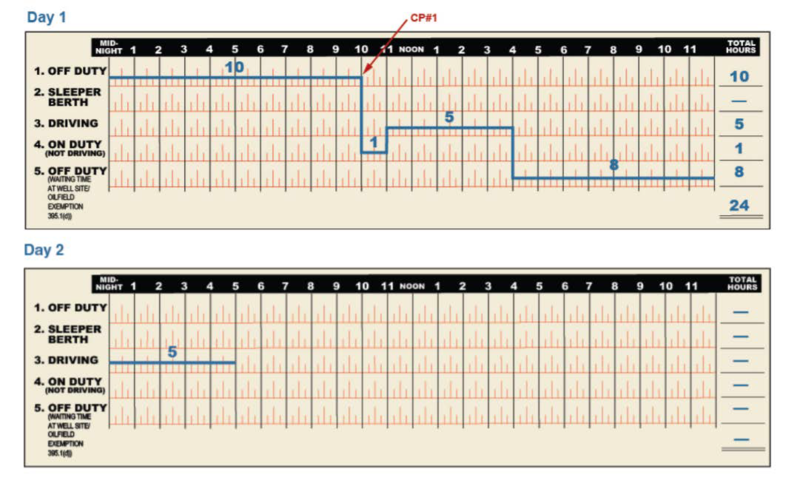 The driver has used all 14 allowable hours at 3:00 a.m. on Day 2, which means he/she must take a minimum 10 consecutive hour break at this point (CP#2).